How Does Marijuana Use Affect Life Insurance Rates? Can I get life insurance if I use marijuana? Over the past 10-15 years, the perception of marijuana has changed. For the most part, there is now wide public acceptance and a trend toward decriminalization. Recent polls show that 64% of Americans support making marijuana use legal. As of today, ten states in the U.S. and the District of Columbia have legalized both medical and recreational marijuana use. Thirty-three states have passed laws allowing some degree of medical use of marijuana, and 13 states have taken steps to decriminalize it to some degree. (Note: Decriminalized possession means there typically will be no arrest, prison time, or criminal record for individuals in possession of a small amount of marijuana for personal consumption. Act would likely be punishable by a fine.) Only two states have prohibited marijuana entirely and have no decriminalization laws in effect. In recent years, the life insurance industry has been adjusting their views and risk classifications in an attempt to keep up with these changes. A big challenge for the life insurance industry is that unlike alcohol and tobacco, there have not been enough studies done on the long-term effects of marijuana usage to determine any definite conclusions in regards to risk of mortality. However, in 2016 the DEA announced that it will end restrictions on the supply of marijuana to researchers so more in-depth studies will now be possible. Marijuana use doesn’t equal an automatic decline when applying for life insurance. In fact, some life insurance companies are even willing to offer their best prices to marijuana users. Each life insurance company has their own guidelines they follow when evaluating the cost of life insurance for an applicant. Because of this, working with Quotacy is the best way to ensure you get the best price for life insurance. Quotacy works with multiple top-rated life insurance companies and we’ll shop your case to those we know are more lenient with marijuana use. How often marijuana is used. When dealing with marijuana use, underwriters are going to pay a bit more attention than usual to other medications the user may be on, their driving records, and their medical history. To determine what risk class to assign to an applicant, underwriters need to determine how concerning the marijuana usage is. Certain factors derived from underwriting will essentially go into a “Less Concern” or “More Concern” list. Obviously, the more factors there are to be concerned about, the higher the risk to insure. If you use marijuana, whether medicinally or recreationally, working with an independent broker that has contracts with multiple life insurance companies is going to give you the best chances at getting approved. Here at Quotacy we work with multiple A-rated insurers. We are keeping the insurance companies anonymous since they are continually updating their guidelines to keep up with these changes. Note: Standard Smoker and Standard Tobacco are the same risk class – some carriers just use different wording. Just as Table A is the same as Table 1. Notes: Standard Non-Tobacco rates assume a negative THC lab test. If use is non-smoked, Standard Non-Tobacco can be issued if no more than 8x per month. More than 3x per month may be rated or declined based on frequency of use. Notes: If use is rare, applicant could be considered Preferred. If applicant uses daily then it’s a decline. If applicant smokes cigars, the number of cigars smoked is added to the number of times marijuana is used. Notes: To receive Standard Tobacco rates, use must be admitted on application. If applicant does not admit use, Tobacco Table B rates will be issued. Notes: If applicant only uses up to 4x per month and THC test is negative, then Preferred Non-Smoker can be considered. If THC test comes back positive, then Standard Smoker rates likely issued. Notes: Applicant must live in a state with approved laws and use must be admitted on application. Ratings more favorable with applicants of older ages. Notes: Tests for marijuana use on all applicants and rates based on concentration level. Notes: Preferred Plus rates assume applicant is over age 18, labs are negative for THC, and there is no DWI or DUI history within last 5 years. Ratings based on age for 5 or more uses per month: Age 18-24 = Table D; Age 25+ = Table B. Notes: Preferred Plus and Preferred rates assume applicant’s THC lab results are negative, that there is no history of substance abuse, and currently in stable employment/family situations. Applicant will be declined if use is every other day or more per month. Notes: All eligible marijuana users are assessed at Non-Smoker rates. Notes: Heavy recreational use, which is considered to be four uses or more per week, is likely a decline. Notes: For recreational use, if more than two uses per month then likely will be issued tobacco rates and possible table ratings. Notes: Standard Plus only applicable for ages 21 or older. If applicant is under 21 then it’s a decline. If applicant has positive THC test and did not admit use on application then it’s a decline. Notes: If applicant rarely uses (two uses per year) Preferred Plus rates considered. If applicant is under age 19 then it’s a decline. If applicant uses over 16x per month then it’s a decline. Ratings for moderate use (8-16 times per month) based on age: Age 19-25 = Tobacco Table C; Over age 25 = Tobacco Table B. Notes: Ratings based on age for 9-14 uses per month: Ages 18-25 = Table 3; Ages 26+ = Table 2. If you use marijuana, whether medicinally or recreationally, working with an independent broker that has contracts with multiple life insurance companies is going to give you the best chances at getting approved. 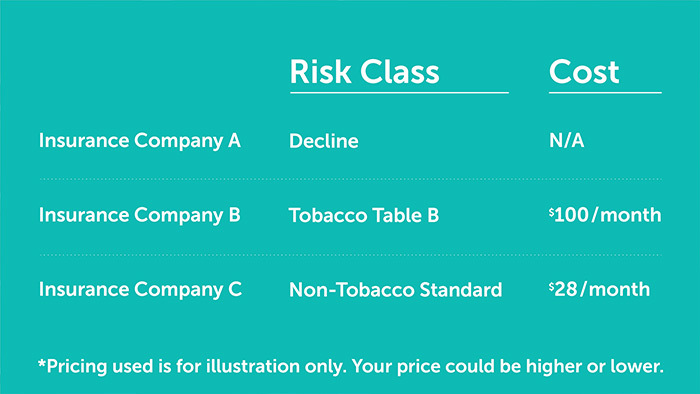 To get an idea of how the risk classes affect life insurance pricing, consider the table below. Keep in mind that this table is for illustrative purposes only and is not exclusive. Table ratings on average can run all the way up to Table J. As you can see from the chart and table above, if you use marijuana, whether recreationally or medicinally, it pays to work with an agency that has contracts with multiple carriers. Their views on marijuana use vary drastically. Let’s take a look at a few examples. Jack Smith is a 35-year-old male who lives in Washington where recreational use is legal. He uses marijuana 5-7 times per week. He is applying for a 20-year term life insurance policy with $250,000 in coverage. Insurance Company F would rate Jack as Standard Non-Smoker and his monthly premiums would be approximately $28. Insurance Company C would table rate him as Tobacco Table B. His monthly premiums would be approximately $100. Insurance Company O would decline him for coverage. Between just three companies there is a difference of $72 per month and having no coverage at all. John Doe is a 30-year-old male applying for a 20-year term life insurance policy with $250,000 in coverage. He uses marijuana recreationally three times a week. Insurance Company M would rate him Standard Plus Non-Tobacco and his monthly premiums would be approximately $20. Insurance Company N would table rate him as Tobacco Table B and his premiums would be $74 per month… that is a $54 per month difference. Jane Doe is a 40-year-old female applying for a 20-year-term life insurance policy with $250,000 in coverage. She uses medical marijuana to help treat her glaucoma. Insurance Company A would rate her based on the glaucoma alone, not the fact that she uses marijuana. Jane’s glaucoma is well managed so Insurance Company A would offer her Standard Non-Tobacco. Her monthly premiums would be approximately $32. Life Insurance Company O considers any marijuana use as tobacco use and would thus rate Jane Standard Smoker and her approximate monthly premiums would be $80… a $48 per month difference. As you have read, marijuana use is still controversial in the life insurance industry. Because use is still illegal on the federal level and because the long-term risks are unknown, the industry as a whole is understandably hesitant to accept it with open arms. However, using marijuana recreationally or medicinally doesn’t mean you cannot get approved for life insurance, so don’t let your fear of being denied keep you from applying. Disclaimer: This post was updated 1/18/2019 and all life insurance underwriting notes are current as of this date, but the industry is continually changing to meet demands. Well, considering that over half of Americans support the legalization of marijuana, 33 states have OK’ed medicinal use, 10 states have legalized both medicinal and recreational use, and 13 additional states have decriminalized it, you’d think you’d be able to find affordable life insurance if you used marijuana, right? Well, you’d be correct! In recent years, the life insurance industry has been tweaking their views on marijuana use. However, a big challenge for them is the fact that there have not been enough studies done on the effects of marijuana use long term. And studying the effects certain factors have on a person’s life expectancy is what life insurance is all about. This is the main reason that not all life insurance companies welcome applicants who use marijuana with open arms. But don’t worry, not all life insurance companies underwrite applicants in the same way. When we say underwrite this is when someone at the life insurance company reviews your application, health records, and medical exam results to determine how much of a risk you would be for them to insure. You are then placed in a risk class. Your risk class determines how much you’ll have to pay for life insurance coverage. If you don’t use tobacco or nicotine products, you can be placed in the non-tobacco risk classes. If you do use these products, you usually get a tobacco risk class. If the risk to insure you is higher than the risk of an average person, you’ll be table rated. Being table rated means you’ll need to pay an extra percentage on top of the standard pricing to balance the risk the insurance company’s taking to insure you. Currently how insurance companies view the risk of marijuana use is all over the map. Some will decline you if you use and some don’t care at all. If you use marijuana, whether medicinally or recreationally, working with an independent broker is going to be your best chance of getting approved at affordable prices because they have contracts with multiple life insurance companies. At Quotacy.com you can see term life insurance quotes instantly without having to give any contact information. And when you’re ready to apply, choose from one of our many top-rated insurance carriers. On your application, if you use marijuana or THC, you’ll be asked how frequently use it, the main purpose of your use, how you consume it, and the last time you used. And based on this information if the insurance company you chose online during the application process is likely to increase your rate because of your usage, your Quotacy agent will reach out to you and suggest switching you to an alternate insurance company. This is just a suggestion though and the final decision is completely up to you. If you would prefer to take your chances with your original carrier of choice your agent will help you out every step of the way. And if you want to switch to the alternate insurance carrier, don’t worry, your agent will do the paperwork behind the scenes and still keep you updated every step of the way. If you use marijuana, working with a broker versus going direct with an insurance company is going to be a huge benefit to you simply because of the insurance companies’ varying degrees of how they treat marijuana use. Let’s look at an example to really show how the insurance company you go with can affect the price you pay. 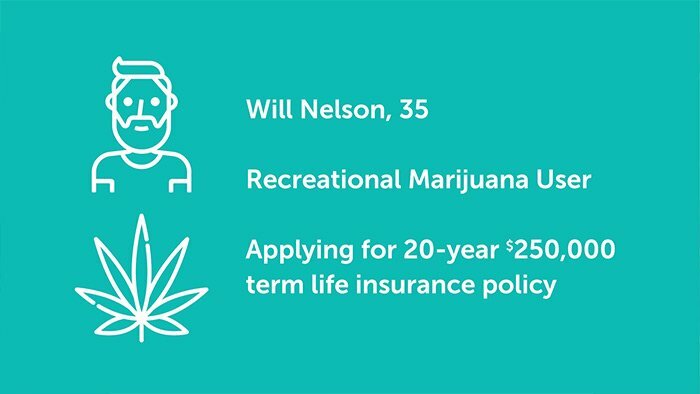 Will Nelson is a 35-year-old male who lives in Washington State where both medicinal and recreational marijuana use is legal. He smokes marijuana recreationally usually every evening after he gets home from work. He is applying for a 20-year term life insurance policy with $250,000 in coverage. Insurance Company A won’t even offer him coverage. They view using marijuana more than 4 times per week to be just too much risk. Insurance Company B will offer him coverage but they categorize smoking marijuana to be in the same risk class as smoking cigarettes. They would table rate Will as Tobacco Table B making his premiums approximately $100 each month. 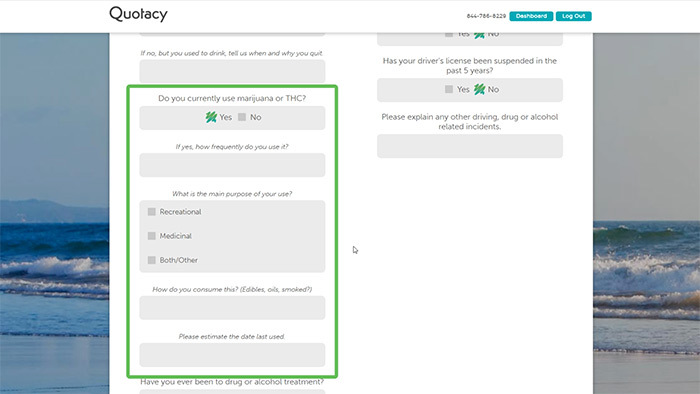 Insurance Company C views marijuana use as low risk and does not even consider it to be in the same category as cigarette use. They offer him Standard Non-Tobacco and Will’s policy premiums would only be approximately $28 per month. Imagine if instead of working with a broker, Will went directly to Insurance Company A. He would have been declined for life insurance and his family left unprotected. Or imagine he just went directly to Insurance Company B. He’d be losing out on saving over $70 per month. Everyone’s situation is different and you may pay more or less than Will but if you use marijuana don’t be afraid to apply for life insurance. Here at Quotacy we work with clients on a daily basis that use marijuana for both medicinal and recreational purposes and we’re ready to help you financially protect your family with life insurance. If you have any questions about life insurance, make sure to leave us a comment. Otherwise, tune in next week when we talk about how life insurance helps small business owners. Bye!